Patrick Duffieux and Anne-Marie d’Anglebermes…an artist couple with multiple palettes! 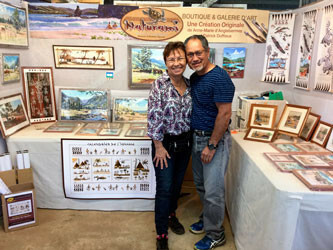 Born in 1956 and 1957, Anne-Marie and Patrick live in New Caledonia, their families home country for several generations, located about 2500 km from Queensland to the east of the Australian continent. Their passion for creating unique artworks came at a very young age and inexorably led them to making it their full-time careers. It is only after many years of having lived their own separate life journeys, different for both, that they meet in 1996 and decide to unite in their creative quest. In 1997, together they open their own Art Gallery, named after their brand NATURAMI, where they exhibit their original creations and their products permanently and throughout the year. 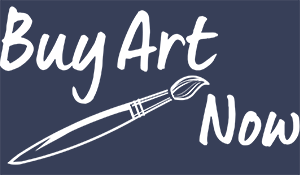 Their Art Gallery is located in Nouméa, in the suburb of la Vallée des Colons, at 81 rue Charleroi. 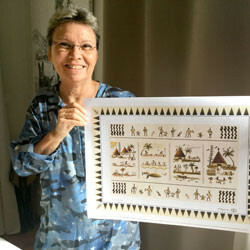 From 1977 to 1996, Anne-Marie’s career success came after numerous art exhibitions and sales of her original artworks, in Nouméa's Art Galleries, but also in other events, places of encounter and exchange throughout New-Caledonia. The artist illustrates by drawing with natural sands of the country, to tell legends or scenes of the tribal and Melanesian daily life. One of these major original works, titled "Yam Calendar", illustrates the phases of the four seasons of Yam culture, a central and sacred element in the Traditional Kanak Culture. In 2006, this achievement becomes an educational tool in the form of a printed poster, commissioned to the Artist by the New Caledonian Education Department. This recognition for her work by the local authorities is a major stepping stone in her career as an Artist. In a very different kind, Anne-Marie d'Anglebermes uses the bark of a very popular tree in New Caledonia called Niaouli, which is also known for its medicinal properties of the essence extracted from its leaves. Arranged and superimposed by the artist, these plant elements give the viewer a pleasant shimmering illusion of a savannah in a landscape of the Caledonian bushland, which she then decorates with acrylic paintings, using subjects like small houses with windmills and cattle nearby or a farmer on his tractor plowing his fields in a plain. This balance between bark and painting portrays, with a sense of nostalgia, distinctive scenes of the Caledonian life, which one can discover on the numerous breeding stations near the Villages and or the Tribes. Anne-Marie expresses her Art through a sensitivity that comes from her family ethnical roots, being both European and Melanesian, originating from the island of Ouvéa and the main land of New-Caledonia. From 1964 to 1970, every year during the school holidays, Patrick joins the family farm located half way between the South and the North of the New-Caledonian main land. 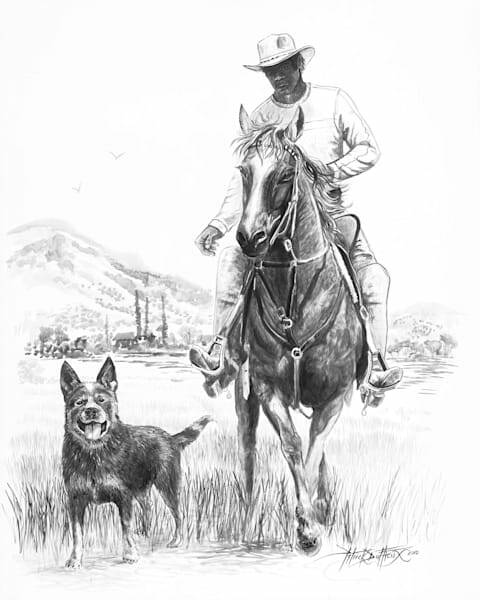 With his brothers they go fishing or hunting and sometimes, on horseback or on foot, they take care of returning the cattle, leading them to shelter on the heights of the plains, before the floods due to the arrival of tropical storms or cyclones. For this artist-in-the-making, these intense moments of freedom during his upbringing, forge his undeniable need to transcribe by drawing and painting on all sorts of materials. Louis, his father notices Patrick’s gifted talent at an early age and decides to take him to his first painting classes with professional artists, who teach him their expertise and the technics necessary for his development. he has been going since, several times a year, thus discovering this immense and magnificent continent with its breathtaking landscapes and uniquely charming population. From 1977 to 1995, returning from France, he offers his services as a draftsman-illustrator at a large offset printing company in Nouméa, which seduced by his portfolio hire him. A few years later, another printing company, screen printing this time, notice his creative abilities and offer him a partnership during which Patrick creates many collections of motifs for printing on various ready-to-wear textiles. 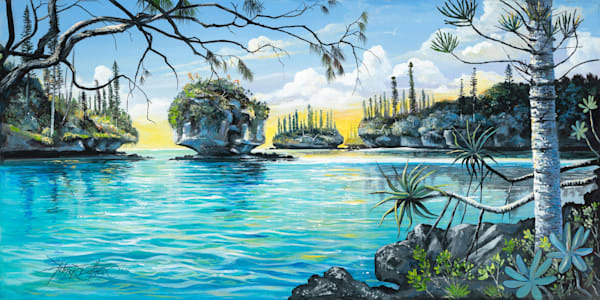 In his spare time, he continues to create with acrylics, watercolors, charcoal and other mediums, creating artworks that he exhibits from time to time in various galleries and other cultural places in Nouméa where he gradually builds his success. Orders of all sorts are placed from various clients, ranging from full wall arts to simple company logos. In 1995, he decides to devote himself solely to his paintings, which at the time become quite popular and appreciated by his ever-growing client list. He registers his brand NATURAMI which becomes a trademark and is applied to all original artworks and or products derived from the brand. Today, the creations of these two artists in constant evolution, reflect more than ever their fascination, their sensitivity and their craze to re-transcribe the many beauties that surround them, whether of human, animal or plant origin, terrestrial or from the four corners of the planet and more particularly from the Pacific - Oceanian zone, which includes the three exceptional countries of Australia, New Zealand and New Caledonia. Exhibition at the Cadr'in gallery in Noumea "Between Sands and Niaoulis ... a path of Word"
Creation of the first cover page of the book "to be caldoche today"
Coral entitled "The sea, space, perception and imagination". Exhibition at the Cadr'in Gallery on the theme: "Identity, Landmarks and Culture". Pedagogical intervention at Pouembout College: Animation of a workshop of artistic expression. Pedagogical intervention at Kaméré College: Presentation of works to students. Exhibition at the House "KOJOL", at the Cultural Center of Koné. First exhibition at the Naturami gallery. Personal exhibition in the new room of the craftsmen's house. Exhibition at the Cultural Center Jean-Marie Tjibaou on the theme: "New yam"
Self-taught artist and Student apprentice of Master Painters, Patrice Nielly and Marcel Petron. Winner of the first Nouméa Comic Book Festival contest by winning the first prize in graphic design. Creations of many collections printed in silkscreen on textiles and on many supports. 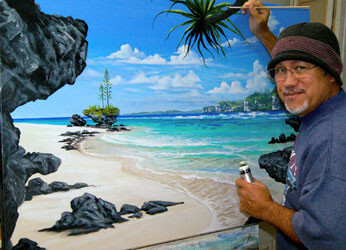 Exhibitions at the ARTEBELLO Gallery in Nouméa, entitled "Nature and Wildlife" and "Canvas to Canvas". 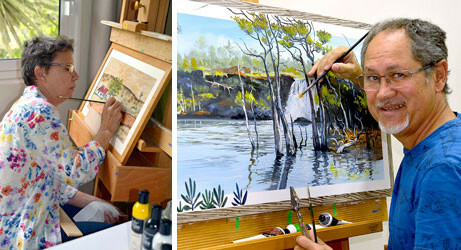 Exhibition at the VERTIGE gallery in Noumea, entitled "Naturami" mixed techniques invented by the artist. Collective exhibitions at the Mairie du Mont-Dore. Murals frescoes at the Compagnie des Maritime Loyautés Station. a lesson to be learned ... "by Eric GUILER and Philippe GODARD, published by Abrolhos Publishing in 1998 in Perth, Australia. Annual exhibitions at the Bourail Agricultural Fair. Event Exhibitions at the "Farino Market". Today, Anne-Marie d'Anglebermes and Patrick Duffieux exhibit permanently in their "Naturami" physical gallery in Nouméa. Discover online, other products derived from their original works on their website. Visit Patrick and Anne-Marie's website here.